Giant cell arteritis (GCA) is an urgent, inflammatory condition of medium sized blood vessels in the body. It most commonly affects blood vessels in your brain. 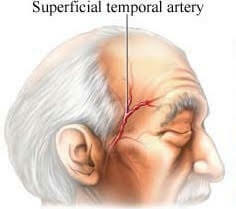 It can affect the blood vessels around the temples, which is how it is also known as “temporal arteritis”. When the arteries become inflamed, they swell and can block the blood flow to certain parts of the body, especially the eyes. What happens in giant cell arteritis? When the blood flow to the eye is blocked, it can cause sudden, painless, total loss of vision. It generally first involves one eye, but if the disease goes untreated, it can affect the second eye causing permanent total vision loss in both eyes within a two-week time window. Vision loss is permanent. Who is at risk for giant cell arteritis? Giant cell arteritis occurs in adults, rarely under the age of 50. Generally, it occurs between the ages of 70 and 80. Women are twice as likely to have GCA, and it is more common in people with Northern European descent. A condition called polymyalgia rheumatica also puts patients at increased risk for GCA. How is giant cell arteritis diagnosed? Giant cell arteritis is diagnosed first with a complete eye exam. This includes dilation of the pupils and possible a visual field test in the ophthalmologist’s office. Blood tests are used to aid in the diagnosis of GCA. A biopsy of the temporal artery may be needed to confirm the blood tests. Other tests, such as an MRI may be needed to rule out other potential causes of vision loss. Although patients may only experience vision loss, GCA is a disease of the entire body. The primary treatment modality in GCA is immediate hospitalization with intravenous corticosteroids followed by a very slow tapering course of oral steroids (prednisone), often with the help of a rheumatologist, often over the course of a year.